Salvation through Jesus is NOT the Good News of the kingdom Jesus was talking about in Matthew 24:12-14 NASB. 13 “But the one who endures to the end, he will be saved. First of all, Jesus was speaking about the beginning of end times NOT about the beginning (salvation) of our lives in Him. The “This” He is referencing is in the previous verse. Have we preached that our love must endure toward the lawless in order to be saved as Jesus said? Jesus spoke what amounts to, an as yet, unfulfilled prophesy! What is the prophecy? According to Jesus “this” shall be preached to all nations and then the end can come.””This” is the message Jesus is speaking of. What is that word “end” referring to? Every end must have a beginning. Is Jesus saying he can return promptly or does the “end” mean all the other events He spoke of will be triggered so that afterward Jesus will return? I believe He is declaring the latter. Sharing Jesus as Savior with others goes without saying. Everyone Jesus was speaking of in Matthew 24: 9-14 already knows Him. “Then they will deliver you…” “You will be hated because of my name…” There is a falling away! That which saves us is what He was speaking of. I am not saying we instantly trigger the trumpet of God and Jesus shows up. On the contrary we, the followers, actually trigger the release of darkness upon the world. The Word says that is the “end” that must come first! God has opened the scriptures that prove how we initiate Christ’s eventual return which must be proceeded by a season of unrestricted darkness. Why would we want to release darkness? We are already seeing darkness rising from the shadows to levels of blatant offensiveness. Our protecting ourselves, by enduring love, automatically releases darkness. As Jesus said our enduring saves us! We do not really have a choice but to prepare and discipline ourselves by Jesus’ instructions and “preach” it all over the world. “This” is a very distressing message, “this” message, will awaken us to our exit strategy as we reach, reach, reach for the eternal saving knowledge of Jesus. KNOWING what He knew IS the “saving knowledge of Jesus.” This is why He came; it teach us. Like Jesus in the garden, knowing the enemy would come for Him, we also will trigger the hour of darkness. Matthew 24:13-14 is not about getting saved it is about staying saved! Many “believers” can be spared from the Apostasy by the understanding found here. Some will but not all will. God knows many are not prepared for what is coming. God knows you are thinking, “I AM SECURE!” The author thought the same thing. Do not bet your eternal life on your current understanding. Jesus is speaking to ALL of us! If we do not accept God’s help, it will be our fault not His. His Word will judge us. Also find in Exit Strategy the biblical difference between reconciliation and salvation! For centuries we have confused the two. Find what John, Paul and Jesus said we must now understand and do, to maintain our reconciliation, so we reach the salvation of eternity, saved by His Way, purifying ourselves as He did, (1 Pet 1:22, 2 Col 11:2, 1 John 3:3) …no spots, no blemishes, holy, blameless! 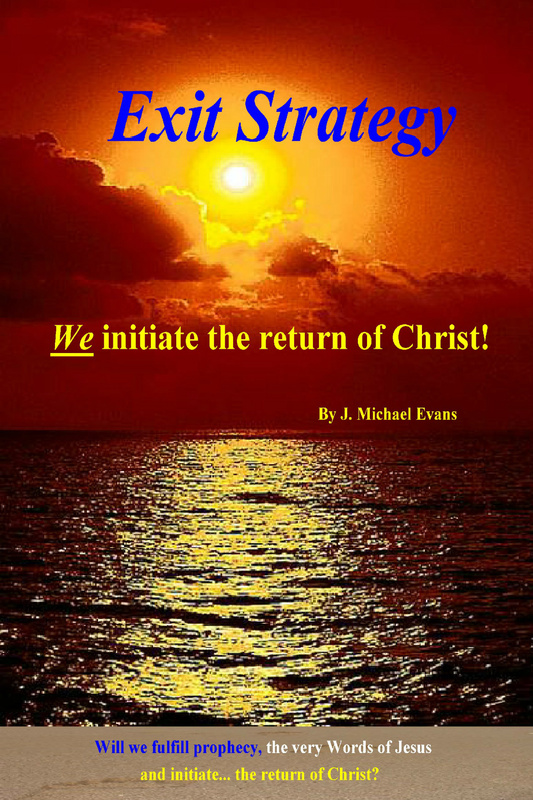 What Exit Strategy declares is shocking, but think urgency not heresy! Being ready to go or to stay supersedes all other scriptural positions. Because fear might have driven us away from the faith and for some it still might, our part in the end to come has been hidden by God until now, I believe, for this very reason. These are the keys to the kingdom. Enduring love is the heart of the kingdom. Why would He give us keys if they are not required? Remember the reward to those who embrace these keys. What is the insight Daniel is speaking of? There is an awakening we have believed would come. The change called for from the scriptures, from our traditional thinking, is so significant God says you will believe and know that this is it! He also says many will NOT! This is the tipping point God has created. As Jesus said in Luke 4:21, the author also believes that in this book, “Today this scripture (Daniel 12) has been fulfilled in your hearing.” Read the blog postings. Read the book. 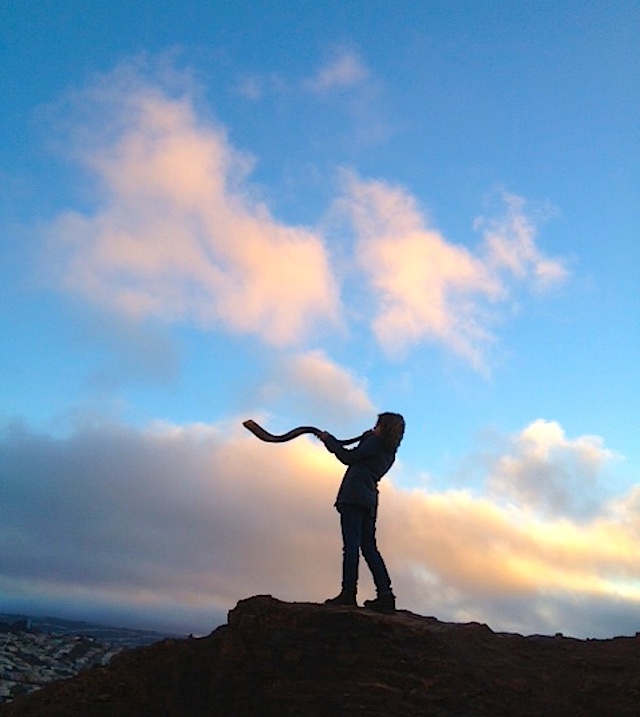 WE ARE the Feast of Trumpets to God Himself as we signal our readiness for all that is coming. How? By embracing and preaching a very specific message. Beloved when it comes, our fellowship in Christ’s sufferings will be eternally worth it! God’s will being done is all that matters. This was Christ’s salvation and reward. It is ours also! Why has Jesus not come already? Doctrines, oral laws, denominational differences, will fall to the wayside in the light of His clarity, His grace, and the singleness of mind we are being called to. God is simplifying salvation one last time. First came the law, then Jesus simplified the law, now God is pointing to the simplest level within what Jesus taught us and yet the most powerful and encompassing Way that will free many and save any who have the courage and inspiration to implement it. “Hear, O Israel! The LORD is our God, the LORD is one! “You shall love the LORD your God with all your heart and with all your soul and with all your might. Contrary to the great movie by Cecil B Demille, The Ten Commandments, the exodus did not happen in broad daylight. Freedom came as the Hebrew people faced the darkness of night in faith. They were told to be dressed and ready to go (Exodus 12:11) as they observed the first Passover meal. It was life or death, darkness was upon them. Their true freedom lay beyond the darkness but they had to endure the darkness first. They trusted God. He had shown Himself strong. Has God shown Himself strong in your life? I say yes. We must have the same heart they had. We must be so glad to be “leaving” that we are willing to face the darkness with relief. We must take into the darkness the light, riches and wisdom of God, the true riches harvested from what we have learned in Christ. By this we avoid being victims of this lost and dying world. We avoid being victims of the powers seeking to cause us to hate and curse others. We will not violate the Word’s of protection given and demonstrated by Messiah Jesus. We will forgive to be forgiven! In this our season of preparation, coming to know good and evil and learning to choose good has always been one of God’s primary goals in us just as it was with Jesus. Very specific instructions direct us to God’s righteousness and His kingdom which are synonymous. (Matthew 6:33 and Romans 14:17 (NASB) 17 for the kingdom of God is not eating and drinking, but righteousness and peace and joy in the Holy Spirit. Unrighteousness will not inherit the kingdom! Jesus taught us and showed us that righteousness does! He taught us what kingdom righteousness is. We must do as He did, think as He thought, and speak from the abundance He has filled our hearts with. As we face dusk, we know darkness follows, it appears to be the sunset of God. God appears to be diminishing as darkness increases. As sure as the world turns, even more surely, when you know God is real and have a revelation, not just knowledge of Him, we shall calmly welcome the darkness knowing,…knowing that the dawn of our eternal existence is coming without fail as surely as darkness precedes the dawn, as surely as His days begin with the evening. So shall ours forever more! Knowing we are prepared, we must accept the darkness and lawlessness as the beginning of our exodus into the millennia, into eternal life. There is a biblical prophesy of America. America, the two eagles in scripture, offer a distressing view of our land where conditions now exist that fulfill the scripture with more distress to come. 3 saying, ‘Thus says the Lord GOD, “A great eagle with great wings, long pinions and a full plumage of many colors came to Lebanon and took away the top of the cedar. 4 “He plucked off the topmost of its young twigs and brought it to a land of merchants; he set it in a city of traders. 5 “He also took some of the seed of the land and planted it in fertile soil. He placed it beside abundant waters; he set it like a willow. 6 “Then it sprouted and became a low, spreading vine with its branches turned toward him, but its roots remained under it. So it became a vine and yielded shoots and sent out branches. Has scripture shown us where America is in God’s foretelling? Do these two eagles sound like and look like America, as she once was, and worse as she is now? In Ezekiel 17 1-10 you will read “Thus sayeth the Lord,” of two Eagles. The first gets its beginning seeds from the cedars of Lebanon bringing seeds to another land, (America) and the roots were deep and healthy because of biblical foundations the land was birthed on. A second Eagle, (I believe today’s America) in verse 7, that land turned its roots upward toward the Eagle for supply. The vine, America today I believe, looked for supply from the second Eagle (the government) and not the God of her origins. Dear God. People, this is America now! Read it especially in a NASB. America has become the second Eagle. Where do we turn to and how do we vote? The phrase, “Ask not what your country can do for you, ask what you can do for your country,” perished by evil doers unknowingly supporting the downfall of America. They thought they were doing good. You say “not me” I am not looking to the government, but what about our fellow Americans? Does the majority turn to the Eagle for its sustenance? Yes they do. Are they not turning away from our biblical roots? Is there not a concerted effort to do so? Does this not foretell our demise? What shall we do? What can we do? Have we completely withered? Not yet. Has the east wind struck us? Do you have any doubt? On 911 and now elected to Congress, the east wind is becoming a whirl wind. As a nation, the majority asked for it. It will be their demise outside of God’s mercy. That mercy is in listening and obeying Christ Jesus only. Evil is upon us and only in Him will we have no fear of evil. “If it walks like a duck…” Those who voted for abortion, look at where their money is coming from. It is ranges from Planned Parenthood, to Democratic party support and greater to Globalist support depending on their public status and influence in the party. They have sold out to the Globalist agenda masquerading as the Democratic Party and among other disastrous things, the Globalist agenda includes a serious if not deadly reduction in the world population. I tell you even as Christ death appeared to be the defeat of God to God’s enemies, so shall our apparent defeat appear as we recognize our apparent minority. We must run to God for the courage and compassion to see through His eyes and survive by interceding for our enemies as Jesus did. They are doomed otherwise. I am telling you Babylon has already come to Jerusalem! We are Babylon in this modern age. Our embassy has been moved to Jerusalem! Peace is being discussed. A covenant as in vs 14 is being negotiated, … an administration (not necessarily the current one,) will betray Israel and betray the God of Israel in the process. See verses 15-20. I have now spoken to you and it is distressing. Will you awaken to everlasting life or to disgrace and everlasting contempt and abhorrence? Dan 12:2. Will Christ find faith when He returns? Will we be standing by faith in the enduring love message Jesus pointed to in Matthew 24: 13-14? Will we endure until the end, in the good news of the kingdom, the enduring love of God. This enduring love was the good news of the Cross. The Lord’s love endured toward all mankind because He knew we did not know better. Now……. Now we do know better. Jesus interceding today can no longer say we did not know better. Until then, when ever “then” is, by our death or the return of Jesus, we are to love like Jesus loved, interceding as we forgive and protect ourselves. We shall rage against the Devil and his works by a holy and High Praise to God for the wisdom He has offered to us, wisdom that will save us as we endure. Just like it did Him. “If we remain in His grip, (under His control and teaching), how far from His heart can we be! My last post was a prayer time inspired scenario delivered as a reporter, where President Trump apologized to the nation and asked their forgiveness for behavior on his part that was caustic and mostly a response to his being, as he rightly believed, falsely attacked. In this imagined appeal by the President, admitting he will swing back at those who take a swing at him, he said his “street fighting” mentality was not productive and asked forgiveness of anyone and everyone for his very direct responses and also forgiveness from those who do support him because they were not pleased with his “tweets” either. Here it is for your consumption. 2 min to read. Fellow Americans I believe I was inspired to write this “speech” because not only is this message for the president but it is the message for all who call themselves believers and more so who call themselves followers of Jesus. Jesus himself has espoused this message as critical to being in His righteous family. Unforgiveness is unrighteousness and unrighteousness will not get into eternal life. “If you forgive the sins of any man your sins are forgiven. If you do not forgive, your sins are not forgiven. Matt 6:14. Why did Jesus include this phrase at the end of the Lord’s Prayer? Daily we should be asking for the details of the Lord’s prayer to be in our lives. Hallowed be Thy name, Thy kingdom come, on earth as it is in heaven, forgive us as we forgive. This wisdom keeps us free and is keeping us in a righteous place with God. Verse 14 is often not included in the “Lord’s prayer” even though Jesus did say it and included it. “Forgiveness” by us of others insures our forgiveness by God. It is as clear as that. I believe President Trump will give the speech you can read attached or a similar speech from his heart and it will get him re-elected in a land-slide in 2020. I believe he will need to give it soon so he can over time demonstrate the peaceful fruit of righteousness that such a speech and sincere intent will bring. He believes in God and it is time for and the opportunity for him to prove it in this humble if not needed effort. Many prophets spoke and the sayings did not come true until later. I thought the speech, the thought I received was for last night. Successfully, what we saw was a very different, much more subdued and “presidential” man. I believe God is working in and on President Trump. Many are praying for him. Start believing for this great, glorifying to God, moment to occur. God will be using President Trump to prepare Americans, if not the whole world, for eternal life, bringing them back to righteousness via forgiveness and intercession for the opposition. Except they repent, the unrighteous ones who have hate in their hearts are eternally doomed. No one called a child of God can want that in your heart. Their doom rests with God and the word of God that will judge us all. Warning: If our life is all about this life, about us and not others, we can never be about heaven. Jesus life was about us not His self. His reward was eternal. Ours can be too! Yes, they hated Him. Jesus said they will hate us too. If our life is all about this life, about ourselves having little or no concern for others, we can never be about heaven. However, “If we remain in His grip, under His control and teaching, how far from His heart can we be! Trump shocks nation by apology! In an almost surreal act the State of the Union address began with an apology to the nation by a man seldom known for such humility. There was bi-partisan approval and standing ovations for an amazing if not shocking display of humility, when the expected was to be a totally bias and conflict filled address. This is what I saw in prayer last night. May it be so Lord, by your mercy and grace. May those who identify with you pass this along and if anyone has access to the White House may this get to the President before tonight for his consideration and confirmation. I believe You Lord have already spoken this to him Lord. I believe You have and we will all be amazed. “If we remain in His grip, how far from His heart can we be! The Wall and what it means. In the grand scheme of things, the wall and what it means is being missed. The globalist movement is a border less concept. It means one world, one government, one religion. It will be one controlling entity and even single payer healthcare is a part of it. Control over you is the ultimate goal because, in their opinion, you need controlling. You need governing because you do not care enough or know enough to do it correctly. They are doing you a favor! This is their means of rationalizing their tactics which are hidden within the conflicts we see. We think it is about a wall and harm to poor struggling immigrants. This is a distraction. Border less means no borders. A wall meant to protect also means to isolate America from her neighbors, to establish a border. This is the opposite of the globalist agenda. It is not about a piddly 5 billion at all. It appears to be but is not really about hatred for the President. Even making President Trump the focus is a scheme in itself. His reactions are a calculated portion whether he knows it or not. It is time we decide whether we are for a one world government or a sovereign nation and the heritage we should cherish. There is always the question of whether we can even stop this scheme that depends so much on the will of a people that have come to depend on government supplementation. Half and more than half of our votes at times favor big government to prove my point. Once in power the Constitution will be modified into non-existence by the globalists. At that point America as it was created in light of biblical justice and fairness to all will cease to exist. What was once thought to be “white man’s world” will finally be realized and missed as being God’s Way world. Yes white men from Europe came with the seeds of Christianity to our shores and their reverence for God found His Way to be security for a fledgling nations constitution. It was to never grow old fashion or oppressive. It was to keep us in a life of justice and liberty. Has it been perverted, has it been manipulated, yes. Has injustice prevailed at times, yes and this is when liberals were quick to blame and capture positions of power. There agenda was not only about power but about how they could move their hidden agenda forward in stealth. We must face the fact that in our liberty some of us, the majority at times, have chosen to remove God from society, kill babies via abortion, and support religions that espouse death to “heathens” which by the way includes all who disagree with them, including Jesus Christ himself. They too will be accosted as disavowed under the plan of the globalists. Religious conflict will end for a season. Many will think a solution to these conflicts will finally have been reached. I share in a recent post about two eagles from Ezekiel 17:2 which I believe clearly describes America as she was and as she now is. Now, she is the second eagle. I will attach the post below. Do we want to lose our nation, the nation that the sons and daughters have died for, that many enemies have planned destruction of only to be defeated utterly. This is the nation God has blessed with forgiveness and grace while knowing a day is coming when even He will give her over to her own desires and the doom which results to any nation that forsakes Him. Choose you this day! It goes beyond choosing America the beautiful. We must choose God and do our part to insure that our fellow citizens know our stand and the righteousness that we stand in. It is a righteousness they too can embrace and in clinging to only One they will divorce themselves from the other who in fact is the enemy of their souls. To illegal aliens who might read this. Choose this day. Become an American by language and conviction. You too can have the dream but your joining a political stand that wants God involved is the only way you can have the dream. America will disappear if we do not get your help and moral strength. Glori adios. Many have lost a loved one and this time of year this season of joy is often diminished by the loss of our loved one. This post looks at an other point of view. For me, in the midst of my loss, the clarity enhanced my relationship with God deeply and my chances of ever seeing Janis again. Someday you might lose a precious one. Maybe you want to read this. In Matthew 24:3-23, Jesus speaks of the trials followers can expect to go through. These are frightening things, threatening things, deceiving things. He says we will be hated by all nations because of Him. In fact it is His love, His Way of loving, that we are to maintain, enduring to be saved. After years and thousands of people around the world praying faithfully for the healing of my Godly wife Janis, God says to me, “I want her with me.” Within hours, she departed. What about all those prayers, those promises? What should my reaction be? Maybe He wanted to see? Not so He would know but so I would know! We shudder as we ask ourselves if we can endure the terrible forecasts of Christ? We have trouble enduring the evening news without a curse if not from our lips, it may be hidden in our hearts! Woe, woe, woe unto us. Lord please help us. I know God did not kill my Janis. Still in a meaningful comparison, God did to me,…..exactly what our persecutors might have done, He took the love of my life away from me. What should my reaction be? Everything we are seeing in life that provokes us to anger or unforgiveness can be used in the plot of the enemy to capture us. Is it possible this Word set Jesus free of our sins before He actually died and will it set us free also before we actually die? What should my reaction be? My reaction toward my persecutors must reflect my reaction toward God over the loss of my sweetheart. “Thy will be done Lord.” I knew, about Janis, what I would have needed to know had we fallen prey to some persecutors of our faith. “Oh death where is your victory? O death, where is your sting?” God’s protective desire, His living will rests within this truth. How could I be angry with God who gave Janis to me to begin with? I have thanked Him in sobbing tears for His receiving her into His care. I have thanked Him over and over for a love that was beyond my imagination, tearfully missing her. But that is God! So what should my (our) reaction be to a persecutor? Have I trained myself or am I training myself to accept God’s will in that case? Will I be light to him? By God’s grace in that case, I will see Janis again and be with her forever. A persecutor will go to hell forever unless he sees the light. How can I endure losing my sweetheart to God in total acceptance of His will and not obey His will that I intercede for those who might kill me? Do I know what Jesus knew? Am I convinced that they cannot really kill me, in the same way that Christ and Janis still live in eternity? God desires that none should perish. He means eternally! We must desire that none shall perish eternally! Christ desired that we not perish eternally. He forgave us and interceded for us! They have no chance unless they see the light, our light, even as we perish, if God wills. What will my reaction be? It would be good for me to know ahead of time. Way ahead of time. Lord help us all. Thank you very much sir, for considering this transmission. Your invitation of the Pope to North Korea is very encouraging in light of the original posting I hoped would reach you. I have added it as a link below. I have readers in China and 40 other countries. First dear respected leader Kim, allow me to apologize for not referring to you properly. I have learned now and I appreciate your kindness and understanding. The tern “Sir” in our society is one of great respect. I hope my use of our term “sir” in this transmission will be received as intended, with great respect toward you sir. Respectfully Leader Kim, I ask you to consider asking the son of the late Billy Graham, who was called “America’s Preacher,” to meet with you also. His name is Reverend William Franklin Graham Jr.
Leader Kim, in America some people are Catholics and some are Protestants. You could in essence reach out to the whole of America by inviting both the Pope and Reverend Graham, especially if you are considering a new heroic policy change toward Christians in North Korea. It is a fact that the Catholic Church will be embraced by the Globalists as the one world religion to be associated with the One World Government, a government that supersedes your leadership and ours. I understand the diplomatic necessity to meet with the Pope. I do ask you to receive my suggestion as diplomatic also in order to broaden your positive impact on the citizens of America as well as the world. As I wrote in the link above, the possibility of a policy change, this would be grace by you toward your fellow citizens that are Christians, will be of epoch proportions, truly a world changer. It is possible that through you Russia and China will also see the value of inviting some of their (in my humble opinion) best citizens back into the fold. Supreme Leader Kim Sir, Many men are recorded in the bible who were leaders but not believers in our God but they were blessed by our God because they were considerate of His people. Dear Respected Leader Kim, every father hopes that his son will be even wiser than he was. Sir, I believe a change in policy toward the Democratic People’s Republic of Korea Christians, freeing them to worship openly, will be revolutionary among nations birthed from revolutions, just as America was also. If I may say Supreme Leader Kim, religion has never been Communism’s problem. We are passive by our faith. Religion was Lenin’s personal complaint as the disappointed son of a preacher. He cursed Christians and God. It stunted the growth of his nation in almost every way. They made wrong choices with Adolf Hitler (a fake Christian) costing Russia millions of people and billions of rubles. Wrong choices and fears of America collapsed Russia’s economy in the last few decades, bringing many questions to mind about communism and any possibilities it will succeed. Russia is a wonderful country and its people are wonderful. I have been there several times to teach and I was always treated wonderfully. Yes, may Russia and its people and its unique character always co-exist beautifully with the rest of the world. I do believe however that Russia is not the economic powerhouse it could be because it has cursed Christians at differing times in its history. In recent years some freedoms have been allowed Christians by President Putin. Russia seems to be growing stronger since then. I humbly ask that you consider inviting Reverend Graham also to meet with you and allow him to answer any questions you might have for him concerning the allegiance North Korean Christians might offer to you and your nation willingly if they were to have the freedom to worship openly and freely. They will be Christians first and dedicated North Koreans second, just like we are Christians first in our country and dedicated Americans second. Christians are not expansionists. We want to live peacefully. We will however fight aggression with a clear conscience, and sacrificially. Is that not the kind of people you want added to your favor? Should you find good meetings with President Trump I humbly suggest if you choose to, that you mention your consideration of a policy change toward Christians. I believe it could have great value to both our countries. I respectfully thank you for your consideration dear respected Supreme Leader Kim. It is an honor that you would hear my petition sir. I pray this post finds its way to you sir.